AirSnore Review: How Does it Work? There’s a whole world of anti-snoring devices out there, ranging from the non-invasive to the quite invasive. The AirSnore mouthpiece is one of the most popular options you’ll find, mostly because it’s non-invasive and highly effective. It’s normal for snorers to check out AirSnore reviews before actually investing in the AirSnore mouthpiece, which is why we’ve outlined everything you need to know about the AirSnore mouthpiece below. Read on to see a comprehensive AirSnore review, and test out this anti-snoring device to see if it gives you a better night’s rest. As with any anti-snoring device, the AirSnore mouthpiece comes with a number of advantages and disadvantages. Here’s a look at specific AirSnore pros and cons as you consider the best anti-snoring device to meet your needs. 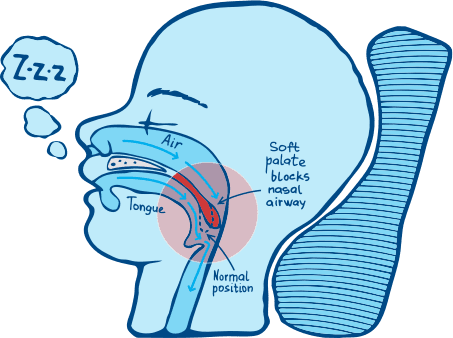 What is AirSnore, and How is it Different? That last bullet point is really important because every snoring mouthpiece uses a different approach to limit snoring. Some keep your tongue in place so that it doesn’t fall too far back into the throat, whereas others actually move the jaw forward to limit snoring. And that’s exactly what the AirSnore does. It’s known as a “mandibular advancement” device, which means that it moves the jaw forward to open up airways (more on this below). 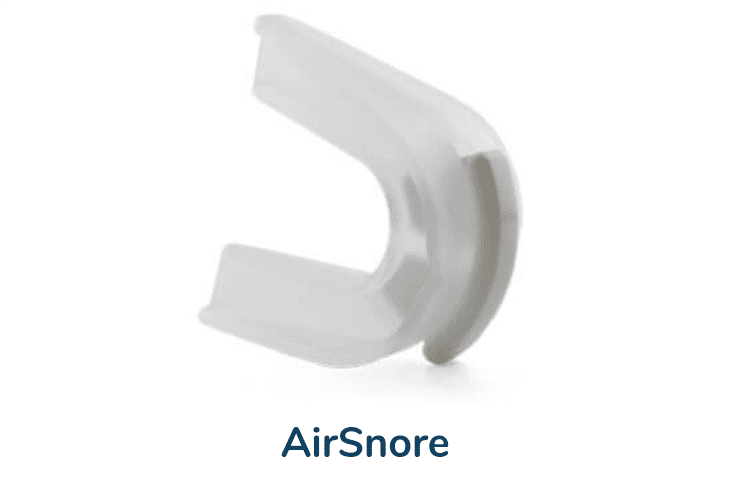 In general, the AirSnore mouthpiece sets itself apart from competitors due to its low price point, overall comfort, and its mandibular advancement approach to limiting snoring. Snoring occurs anytime that airflow becomes constricted during sleep. Airflow can be constricted in the throat, mouth or nasal passageway. As noted above, there are different approaches to alleviating this issue. The AirSnore mouthpiece actually moves the jaw forward so that air can flow freely in and out of your body, which limits snoring. When you first get AirSnore, you’ll place the device in hot water until it becomes slightly soft. You’ll then place the device in your mouth and bite down to fit it perfectly to your teeth. After this sizing exercise, you’ll find that your AirSnore device is customized to your mouth. Do you Want a AirSnore Anti Snoring Mouthpiece? Almost anyone can use AirSnore because the mouthpiece is a one-size-fits-all device that you can customize to your mouth and teeth upon purchase. Of course, everyone has a slightly different sized mouth. Unless you have an unusually large (or unusually small) mouth, the AirSnore should do the trick when it comes to limiting your snoring. How Does the AirSnore Mouthpiece Stop You From Snoring? The AirSnore mouthpiece is a mandibular advancement device that specifically moves the jaw forward to limit snoring. In some cases, people snore because the jaw becomes overly relaxed and slips back into the throat during sleep. The AirSnore specifically prevents that phenomenon, which, in turn, prevents snoring. If you’re looking for AirSnore reviews, you most likely have questions about how the device works as well as other aspects of the AirSnore mouthpiece. To help you make the best and most informed decision before you invest in an anti-snoring device, here are answers to some of the most frequently asked AirSnore questions. What is AirSnore Made of? The AirSnore mouthpiece is made of moldable plastic, which is what makes the device both customizable and comfortable to wear. Many people grind their teeth at night, and the AirSnore mouthpiece is made of a material that ensures that grinding won’t lead to any permanent damage to the teeth (or to the anti-snoring device, for that matter). This is common among anti-snoring mouthpieces. While they may use slightly different materials, in general they are all made of some form of moldable plastic. Is the AirSnore Mouthpiece Comfortable to Wear? The answer is both “yes” and also “it depends.” Yes, the AirSnore mouthpiece is comfortable for most users. It’s designed to limit or eliminate snoring without being too invasive for the wearer. With that said, all snorers are not created equal, and some users report that the AirSnore mouthpiece isn’t as comfortable as they would like it to be. It’s important to know that AirSnore and many anti-snoring devices require a period of adjustment. It will take several days or even weeks before you become fully accustomed to wearing it. In some cases, snorers never fully adjust to a specific anti-snoring device, and some users even report that the AirSnore mouthpiece actually falls out of the mouth repeatedly during the night, which makes it difficult to use and limits overall effectiveness. This is why it’s important to take advantage of the 60-day money back guarantee. Test out the AirSnore mouthpiece and make it sure it works for you, or return the device if you’re not getting the desired results. Some snoring mouthpieces are adjustable and require a tricky sizing process before you can use them. Fortunately, that’s not how AirSnore works. The AirSnore mouthpiece is really quite simple when it comes to fitting. Simply dunk the device in hot water until it becomes soft enough to make an impression. Then place the device into your mouth and bite down. You’ll create teeth marks that essentially customize the device to your mouth, creating a perfect fit. This should work for almost any adult. That said, if you have an unusually large or unusually small mouth, you may find that the device is difficult to mold or that it doesn’t fit into your mouth in a way that promotes comfort. AirSnore is a little unusual in that its distribution is limited. Many anti-snoring devices are available through Amazon and other large retailers. While you may be able to find the AirSnore mouthpiece through some of these other retailers, the best place to buy it is directly through airsnore.com. 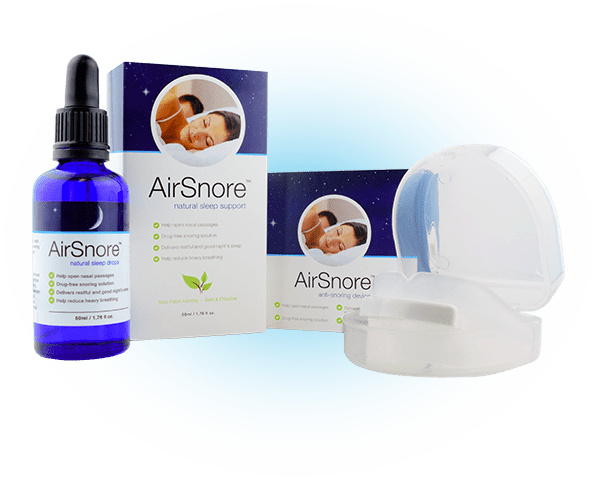 AirSnore is currently available for $49.95, and you can also explore anti-snoring essential oils that are sold with it. In fact, there’s a combo pack available that delivers both the AirSnore mouthpiece as well as essential oils known to combat snoring. Using AirSnore is actually quite simple. First, you “fit” the device using the molding process outlined above. Then, when it’s time to go to sleep, simply place the AirSnore mouthpiece into your mouth. You may feel slight tension at first as you get used to sleeping with AirSnore, but that tension is simply your jaw moving forward to limit snoring. As previously noted, some users experience challenges like perpetual discomfort and the device falling out of their mouths repeatedly. For the most part, users acclimate quickly to AirSnore and get the results they want. Final Verdict: Is AirSnore Worth the Investment? There are so many anti-snoring devices on the market, and it can be hard to make sense of them all. In general, the AirSnore mouthpiece is one of the most effective and most affordable devices you can choose. As an added benefit, AirSnore is relatively non-invasive compared to alternative anti-snoring devices, which means greater comfort and the ability to sleep without any discomfort or disruption to your routine. The most important thing is to just give it a try. AirSnore offers a 60-day money back guarantee, and you should commit to taking advantage of that grace period. Snoring is not only inconvenient and disruptive, but it can also be harmful to your health. If there’s a device out there that can alleviate your snoring for less than $50, it’s well worth the investment. One final note: You can always talk to your doctor about snoring and ways to eliminate it from your life. You’ll find that doctors will typically mention snoring mouthpieces like AirSnore as the best place to start.